If I were to hand my six-year-old 2 cookies and ask him to share it with each one of his siblings, he would know what to do. He would simply cut each cookie in half. Almost instinctively, he can see that he gets half, his brother gets half, and his twin siblings will each get half. In situations like that, dividing makes sense. Place a problem like 2 ÷ 4 in front of him, however, and confused looks are inevitable. 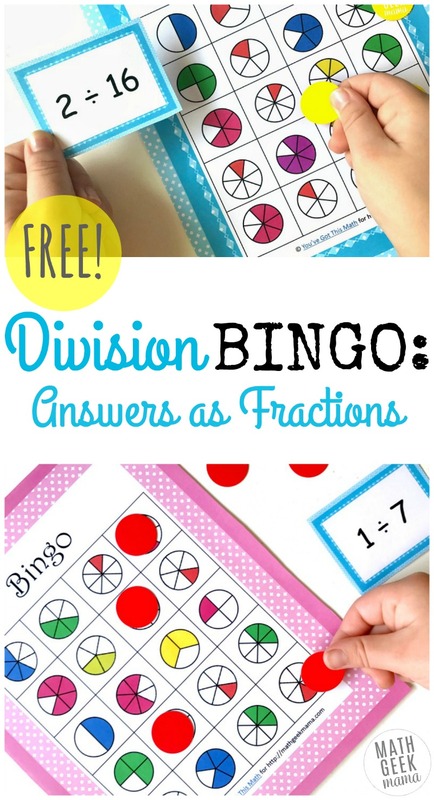 So today I’m going to share a little about the relationship between division and fractions, and a fun division BINGO game to play to practice this important skill. Enjoy! Can you divide up these cookies equally among your group members? How can I share these cupcakes with our family so that everyone gets the same amount? Can I cut up this piece of bread so that everyone gets the same amount? Hint: Food can sometimes be hard to divide up. I suggest using something that is easy to cut and make sure the group size works. Though possible, 3 cookies for five people is going to be a lot more work, since they will have to cut the cookies into five equal pieces. Interactive notebooks are a great way to move from a real life problem to paper and pencil work. This free interactive notebook has word problems with pictures of food that children can cut up and glue in under the cute clip art people. This will help them transition from the concrete, hands on introduction to solving on their paper. Many children need to practice a skill over and over to be able to master it, but very few kiddos like to sit and do worksheets. 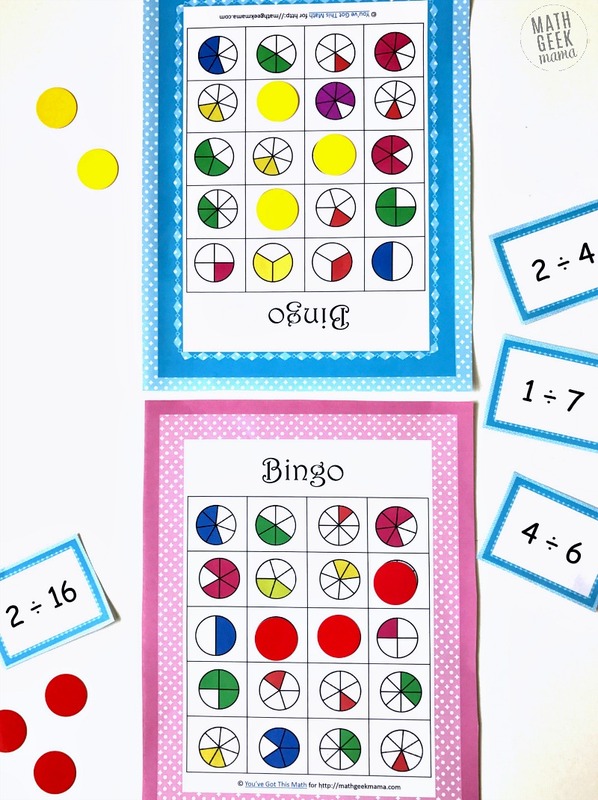 Games are a great way to get them to practice skills in a fun way. 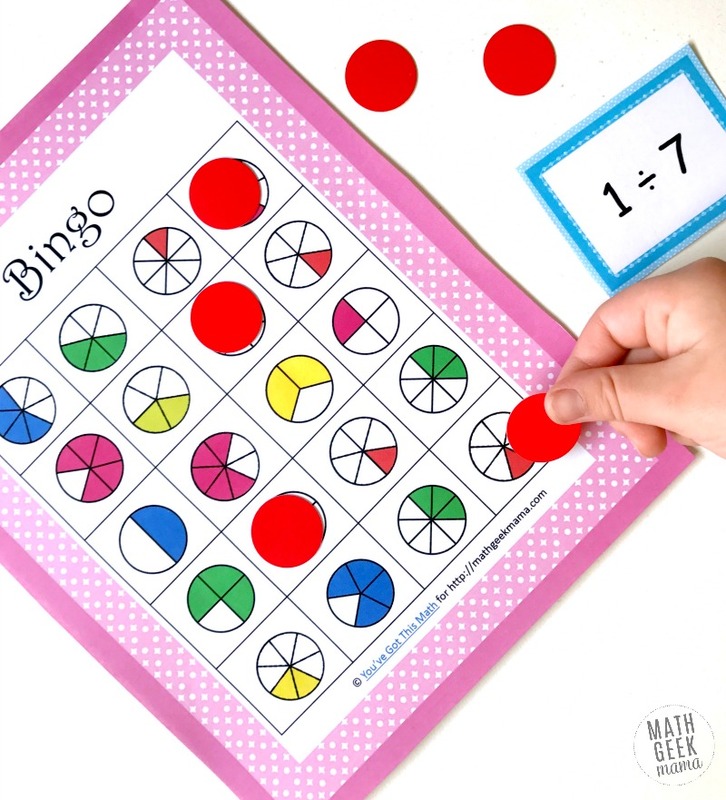 This game is just like any other BINGO game you have played, though I recommend playing in a small group so that you can check their answers. Begin by either passing out an expression to each child, or holding up just one and allowing the whole group to solve together. When the players correctly solve the problem, they find the visual model that represents their answer on their game board and cover it up. 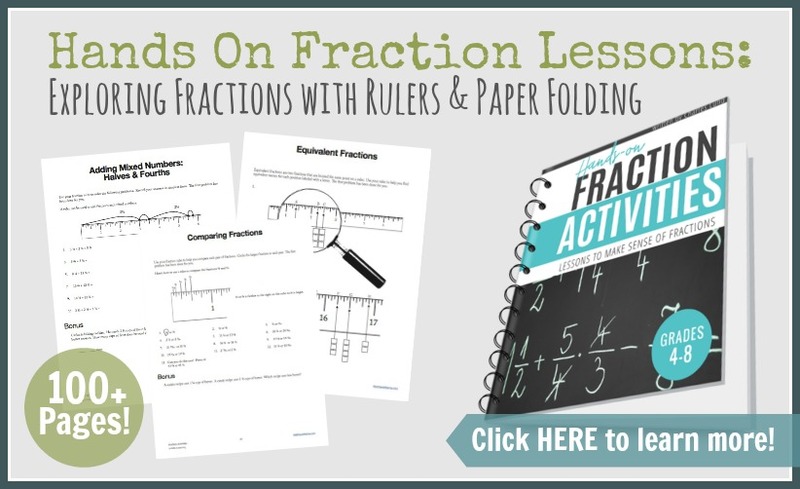 Though that seems pretty straightforward, students will be forced to simplify or recognize the equivalent fraction model before they can find a box to cover up! The first person to get four in a row wins! 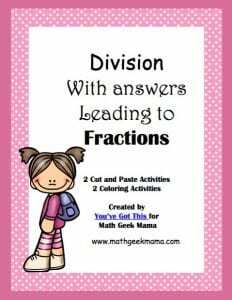 It is always important that we know exactly what our children can do on their own, and these cut and paste and coloring activities, which are included with a Math Geek Mama Membership, allow you to do that. 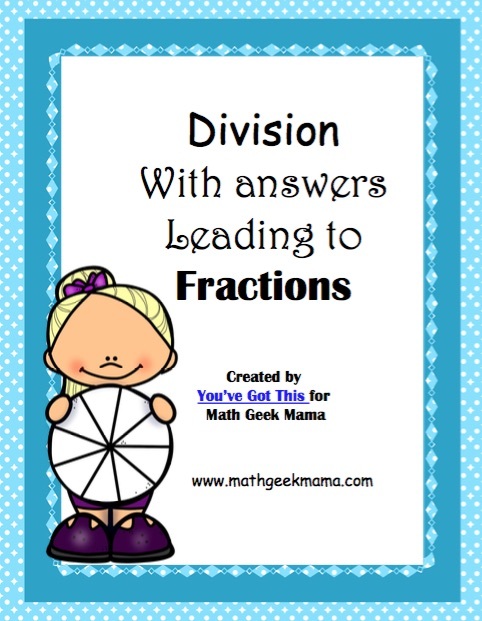 On one set, kids cut out and sort the division problems and glue them under the correct answer. On the other set, kids get to solve a problem and color in the monster that has the correct answer. Though this may not have been a skill you would have associated with division, it is still an essential one. Have fun teaching it! You’ve Got This. Rachel is a homeschool mom to four little ones, ages 2 to 6. She is a former public elementary school teacher, and has recently begun blogging at her page You’ve Got This. You can also find her on Facebook and Pinterest. 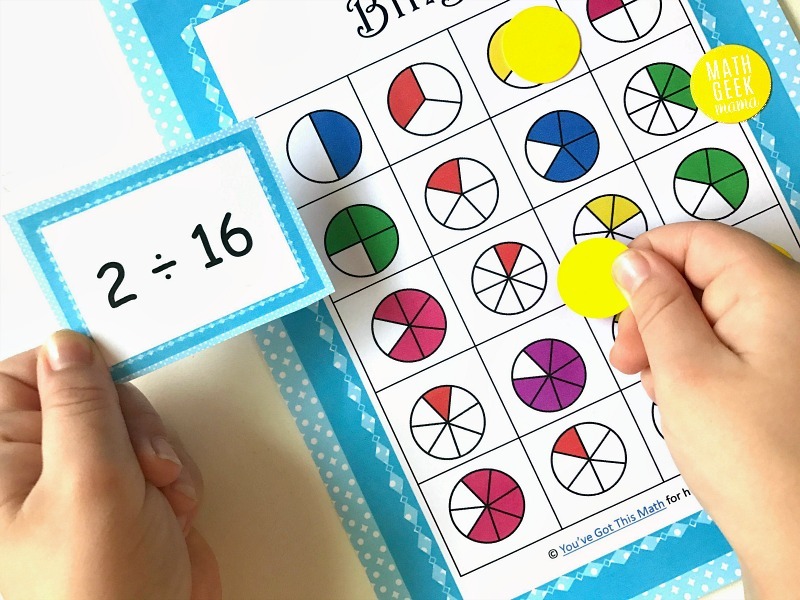 Love it, what an ingenious way to learn math! love it ! thks for sharing … where can i find the link to download? Hi Rina, just above this you should see a link that says, “Click here to go to my shop to get the free…” You just click that to go get the download. Hope that helps!